Addition flashcards are great practice for memorizing the very important math facts. Nowadays, many kids are counting on their fingers for simple addition! Lots of kids are struggling with 6-12 grade because they never learned their math facts back in the elementary grades. Print the flash cards off right from your computer and you're ready to go! You will need to have adobe software on your computer for this. If you don't have the latest version you can download here. These sets of free addition cards include the facts from 1 to 12. For example the 2's start with 2 + 1 and cover each fact up to 2 + 12. More Addition Cards to Come! Check Back Soon and Be Sure To Bookmark Us! Print the cards off right from your computer. You can put them on card board and laminate them after you cut the out and use them over and over again. Click on the link to open up the flashcard. Each page of the PDF has 2 flash cards with their front and back sides connected. Creating the cards. Cut around the outside rectangle of each flashcard. Then fold the flashcard along the line in the middle. Attach the backs together using either tape or glue. Tip: I like to insert a piece of cardboard between the back and front of each card to give them more support and also helps them last longer. I also prefer using a glue stick because it's not as messy as liquid glue. Or if you prefer, clear tape works well and doesn't leave a mess. NOTE: If you have any questions or if you need a custom set of free printable math flash cards other than those above, drop me a quick email and I will try to help you out. You might also enjoy some of our math games using Flashcards. Have you tried turning your addition flashcards into fun math games? If not you're missing out on all the fun! Flash cards are great for practicing addition facts and kids enjoy them because it's hands-on learning! 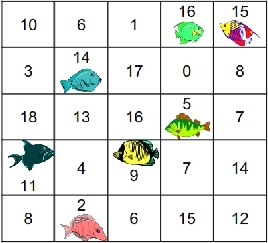 Fishin' for Addition: Kids will enjoy this addition game that focuses on addition facts up to 9+9. All you need are a few popsicle sticks and the printable game cards we provide.